An upcoming Lenovo smartphone with model number L38083 has been spotted in a fresh Geekbench listing today. 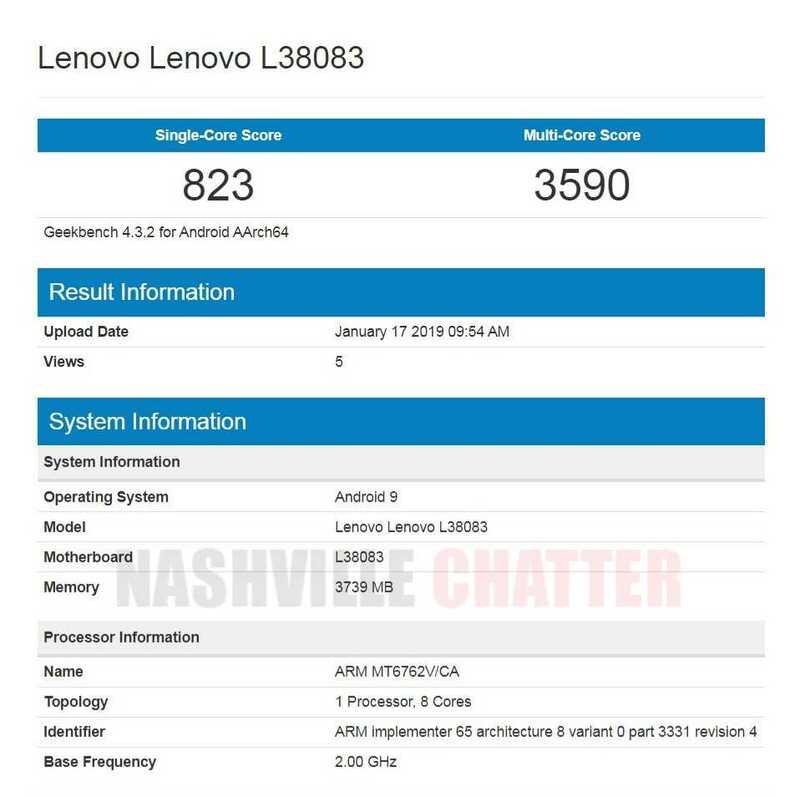 Lenovo L38083 Geekbench listing reveals that the phone has 4 GB RAM and is powered by MediaTek Helio P22 octacore processor denoted by MT6762V/CA that clocks at 2.00 GHz. This listing also confirms that the phone will ship with Android 9 Pie out of the box. The Geekbench score shows that it scores 823 points in single core score and 3590 points in multi-core score. Given the other specs and the processor information, it is safe to say that this is a mid-range device from Lenovo. None of the Lenovo phones in the recent past have come with MediaTek processor and almost all its recent phones have sported only Snapdragon processors from Qualcomm. Lenovo K9 is the only phone launched in the second half of 2018 that came with the same MediaTek Helio P22 processor. However, this phone can be expected to have slightly better specs than Lenovo K9 as evident from the 4 GB variant seen on Geekbench, despite using the same Helio P22 processor, which is a 12nm processor that clocks at 2 GHz. The screen size could be close to 6 inches and front camera could be 16MP. Also Read: New Lenovo Tablet with Huge Battery Passes FCC Certification; Could it be Lenovo Phab 3? Another lenovo phone in the making is Lenovo A5s, which is the successor Lenovo A5. This phone has already bagged certifications from BTSIG and Indonesian certification bodies and comes with MediaTek Helio A22 (MT6761) SoC. Other rumors reveal that the screen size of this low-end phone phone would be 720 x 1440 pixels and RAM would be a meager 2GB. However, even this low budget phone is expected to ship with Android 9 out of the box. Regarding the new Lenovo phone found today with model number L38083, it has been spotted for the first time here in Geekbench and this has not appeared in any other certification sites so far. We’ll keep you posted as we await more details about this mid-range smartphone.